Dione Venables has complied an anthology of George Orwell’s poetry, titled George Orwell: The Complete Poetry, published this month. Here, she writes exclusively for The Orwell Prize about Orwell’s poetry and why she engaged in the project. Having read Keep The Aspidistra Flying by George Orwell, and so enjoyed the way he created a poem gradually, as the story developed, I began to look for other poems that he had written. Of course the first ones were those that he wrote to my cousin Jacintha Buddicom when they were young and learning about the need to control their feelings. For many years I waited for one of the academics to gather together all of Orwell’s poetry, examples of which I would come across now and then within his essays and novels – but it simply never happened, although writer, biographer D.J.Taylor penned an excellent essay on the subject of ‘Orwell and Poetry’ in 2009. In 2014, with that singular essay still in my mind, I decided to wait no longer but to do the searching myself, and what a search it turned out to be. 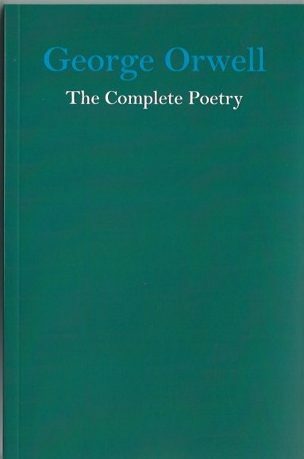 To be honest, I do not know whether all the poems have been located, but because the clock is ticking for me, by January 2015 it was clear that I had combed enough through the twenty volumes of Peter Davison’s superlative George Orwell: The Complete Works. I went from reference to page; from page to reference for days and weeks until I was getting rather good at finding my way through these beautifully compiled and edited volumes. I even learned much about layout and indexing from them when I was deciding how to present the forty two poems which was the total harvest of my labours. Poems are not like normal text. They are created out of emotion of one kind or another and this was an area of Orwell’s psyche that had not been seriously explored in depth. It made me aware that I should introduce each one, explaining Orwell’s reason for writing when I could, and generally giving an account of his health, progress as a writer and translating the slang that was very much part of the first half of the 20th century. It seemed to me that, without such an introduction, students or readers from other countries would simply not understand what was behind what he was trying to say, and this is the way each poem is presented; in a framework of sympathetic comment, so that when the poem is less than brilliant (and there are several that are below standard!) the reader will at least be ready for anything! It sounds rather a strange arrangement – but it seems to work. It has to be understood that George Orwell’s poetry was not written to be compared with his political writing or his essays and novels; he wrote because he felt passionately about something at that particular moment. Sometimes the result was beautiful, mournful, hilarious – and sometimes anger or defeat bled the inspiration out of him and left the reader disappointed. I’ll show you what I mean. Written by the eleven-year-old Eric Blair at the start of the First World War. Here is the energy and excitement of a child’s romantic view of warfare, pitched into reality by the early death in battle of a cousin. Potential talent here – but nothing extra-special. By the time he had matured, shaped by disappointment, lack of money, and the beginning of poor health he had begun to look around him and see things. That sharp and deductive curiosity of his gradually needed another direction for the great flow of his creative mind, and soon the pain of living in his world needed ‘letting’. Bitterness had nowhere to go but through grey and fruitless verse, and his poetry did much to allow him full expression as his health deteriorated. Eric Blair had become George Orwell by the time his mood lifted when he married Eileen O’Shaughnessy in 1936. His verse became more joyful again for a spell and, writing with more success, he was able to express the new well-being in both heart and body. And watch my walnuts grow. But then he became involved in the Spanish Civil War, was wounded in the throat and the pleasant, cultured baritone voice took on an unattractive squeak. The experience never left him, all the same and his poem ‘The Italian Soldier Shook My Hand’ seems to be the one that most academics remember and approve. The Blitz, with Eileen beside him, brought forth both his humour and his regret and he was able, when it was all over and he could think back, to remember it with sadness tinged with amusement. Of the male and the female snore. Then Life turned another corner, his treasured son Richard came to them, and Eileen died only months later. The light went dim again and never really recovered. Orwell was, by this time, making an impact on the world of political thought, his essays were read and respected and his health was fading as he put his mind to his last two books; both of which established his name firmly in the hearts of both the literary world and the casual reader. The poetry seemed to fade away and only the verses in Animal Farm were left, and a sad little obituary written for an imaginary old countryman, in the last days of his life. With the little book here in my hand at last, I wonder whether it could have been presented in any other way. You’ll have to be the judge of that.